Kendra Storm Rae Photographer is a Canadian Photographer based in Germany (Munich and Berlin). She is available for Fashion, Beauty, Portraiture, Creative, Live Gig's, Press Kits and Weddings. Kendra's publications Glass-Book Online Magazine Modo Online Magazine Huff Online Magazine Klassic Online Magazine Fashionising Online Remark M..
Valentin Mocleasa is a photographer and art director based in Berlin. His work is characterized as cinematic and surreal, but in the same time dramatic. He specializes in contemporary portraits and breathtaking images. He has a background in creative arts (design and visual arts education), and is well-rounded i..
Petra van Raaij is a Berlin/ Cape Town based Fashion Photographer, originally from the Netherlands. She first discovered her passion for Photography while studying Fashion Design,at the School of Fine Arts in Maastricht. After that, Petra enrolled as a successful Free-lance Make-up Artist, working all ove..
Marco was born in Freiburg, Germany. 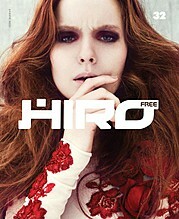 He works in the genre of advertising and fashion photography. Marco likes to shoot elegant images with a strong visual style & sophistication. Since 2011, he is based in Hamburg. About His study as a professional computer scientist in the area of design & web developing ..
Thomas Seifert is a photographer and image retoucher. Working as a freelance photographer in fashion and beauty 2009 Abitur, internship Thomas Schmidt 2009-2010 traineeship MyBrands 2010 temporary employment Zalando GmbH 2011 communication design study, HAW Hamburg magazines Bold C-Heads Creem Disfunkshion Dorian Elle.de Ellements Fault Glassbook Handmade Ku..
Capturing a moment and the expressive power of a single image is what fascinates Lee Maas about photography and drives him to do what he does. Lee Maas favors portraying musicians, artists and personalities with a certain depth and substance. He also works in fashion and commercial photography and adds his personal aesthetic vision to e..
Maurice Luckett was born on 13 February 1985 in San Bernadino California. He is a self taught photographer and started his career in March of 2008. In January of 2009 he decided to focus on Fashion Photography because he was fascinated with the freedom and imagination that came with Fashion Photography. In the middle of 2009, he was dep..
Marco Rothenburger is a german beauty and fashion photographer based in Hamburg germany. Marco however has the wonderful ability to tell a story through his photographs. Today an international photographer working all over the world in advertising and editorial network. Marco is a self-taught artist.